Verizon took out full-page ads in The Washington Post, The New York Times and several other major newspapers on Tuesday to outline its 5G marketing message and attack competitors, though not by name. "We're calling on the broad wireless industry to commit to labeling something 5G only if new device hardware is connecting to the network using new radio technology to deliver new capabilities. Verizon is making this commitment today: We won't take an old phone and just change the software to turn the 4 in the status bar into a 5. We will not call our 4G network a 5G network if customers don't experience a performance or capability upgrade that only 5G can deliver," wrote Verizon's new CTO Kyle Malady in a blog post on the topic on the company's website. Verizon is calling out AT&T's recent decision to begin branding its LTE Advanced phones as "5G E." AT&T began laying the groundwork for that action in 2017 when it announced it would apply the "5G Evolution" branding label to markets where it had deployed LTE Advanced technologies like 4x4 MIMO, LAA and 256 QAM. Then, late last month, AT&T said it would expand on the effort by replacing the "LTE" icon on phones in its 5G Evolution markets with a "5G E" icon -- a move likely to eventually affect millions of AT&T Android smartphone customers in AT&T's 400 5G Evolution markets across the country. Customers who went to bed with LTE phones will wake up with "5G E" phones. Verizon's CTO tacitly argued AT&T's actions would cast a shadow over the wireless industry's efforts to generate new revenue from 5G. 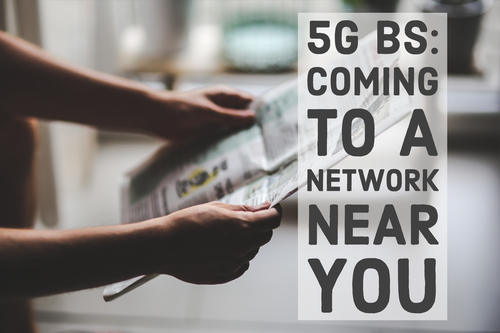 "People need a clear, consistent and simple understanding of 5G, so they are able to compare services, plans and products, without having to maneuver through marketing double-speak or technical specifications," Malady wrote. "Our industry knows 5G will change the world. Let's uphold that promise, while maintaining our integrity. The success of the 5G technological revolution must be measured in truth and fact, not marketing hype." Not surprisingly, Verizon isn't the only company complaining about AT&T's decision. As noted by MWL, T-Mobile used its main corporate Twitter account to poke fun at AT&T: "Didn't realise it was this easy, brb updating," the operator wrote, with a video of someone taping a 9G sticker onto a smartphone. And in a statement this week Sprint said “AT&T is blatantly misleading consumers – 5GE is not real 5G.” Sprint added that it will launch “real” 5G later this year. Verizon, of course, is branding its 5GTF fixed wireless standard as 5G. The carrier teamed up with Ericsson, Qualcomm, Intel and Samsung in 2015 to create the 5G Technology Forum (5GTF) to create its own proprietary standard for wireless transmissions in the millimeter-wave spectrum. The 5G Home service that Verizon launched in four markets in October relies on that standard. Further, Verizon has said it will eventually rip out all that 5GTF equipment -- both on the network side and in customers' homes -- and replace it with 5G equipment that adheres to the 3GPP's 5G standard. Verizon has argued that its 5GTF standard is very similar to the 3GPP's 5G standard and that its 5G Home service launch allows it to gather key market data as it works to use 5G technology to challenge wired internet service providers like Comcast and Charter with a fixed wireless alternative. AT&T accused Verizon's 5GTF service of being a non-standard 5G offering that didn't really count as an official 5G service. Instead, AT&T argued its own launch late last year of a mobile 5G service in a dozen cities using the 3GPP's standard for the technology was the country's first "official" 5G launch. However, AT&T's mobile 5G service is only available to select customers and lacks many of the particulars -- such as network usage stipulations and detailed pricing information -- that a typical telco service launch would include. "While some may decry [AT&T's 5G E branding] as 'Fake 5G,' the more important reality is that the step function increase in spectrum being added to the network should result in AT&T subscribers experiencing notably faster speeds when the 5G E tag is showing on their device," wrote Wall Street analyst Walter Piecyk of BTIG Research. "Meanwhile, the broad availability of 'real 5G' could be years away, providing AT&T with a window of opportunity to surpass Verizon's historical dominance as the wireless network leader in the United States." Specifically, Piecyk noted that AT&T's "5G E" branding effort coincides with the company's deployment of fully 60MHz of new and unused spectrum -- ranging from 700MHz to AWS to WCS licenses -- into its network. Piecyk argued that the addition of all that spectrum would give AT&T's network "a big lift." "Whether it's 40 MHz or 60 MHz in a given location, this network investment is meaningful relative to the ~100 MHz of spectrum used by AT&T today and its ongoing conversions of 10-15 MHz of existing spectrum from 3G to LTE," he wrote. Thus, the rollout of 5G appears set to follow a similar trajectory to LTE and 3G before it, at least in terms of marketing. After all, both AT&T and T-Mobile branded HSPA+ -- widely considered a 3G technology -- as 4G before the arrival of LTE network technology. The rollout and branding of 5G, however, will be more complicated. While 3G and 4G primarily leveraged low- and mid-band spectrum, 5G promises to also make use of the so-called millimeter-wave spectrum bands -- generally those above 20GHz. Long story short: Because of the limitations of the tech, gone are the days when carriers can light up an entire metro area with a few massive cell towers and the flip of a switch. AT&T is using the "5G E" label for its LTE Advanced markets and the "5G+" label for transmissions in its millimeter-wave spectrum. But Verizon's Malady argued that 5G should only be applied to "new device hardware" connecting to "new radio technology," and made no mention of the spectrum involved. The argument of what can be called something 5G-related will mutate again as T-Mobile and Sprint enter the 5G game. And there's no telling what branding they'll use. We've updated this story to add Sprint's comment (7th graf). That is all.